As we promised, now that Conversion Conference in San Francisco has come to an end, it’s time to reveal some of the highlights that came out of each day we were there. So, if you couldn’t make it to San Francisco, this post is going to get you up to speed on everything! Not just a quick summary, but also the best tips from some of the top conversion experts that were there. Ok, so let’s get started! The Conversion Maturity Model - A Roadmap to Profitability by Tim Ash. Tim Ash opened the event with his session about the differing Phases of CRO, from a company that’s basically an un-optimized company to an advanced, well optimized company. Here’s how Tim explained these two phases. Basically, when a company transitions from where the CEO decides everything with regards to website optimization, with no testing or measurement (in other words, un-optimized) to a company where there is a formal conversion optimization process ( or advanced). This final phase will usually take the form of an organized conversion optimization team that reports directly to the CEO alone. Everything will be tested strategically and every action is measured and analyzed fully. Tim explained that there are only just a few companies that will fall along the advanced stage of the pyramid, because there is almost always something to improve in all of our conversion optimization processes. 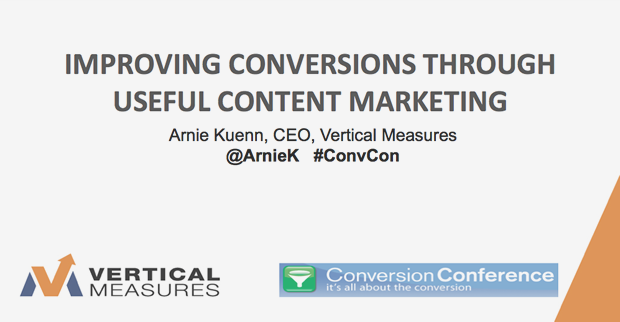 Improving Conversions Through Useful Content Marketing by Arnie Kuenn, President at Vertical Measures. Arnie did a fantastic job of explaining how content is becoming more and more important in helping increase conversions and also how now “Relationships Are Created With Information Not People". He shared how engaging content is always the way to get people interested in your brand before they starting thinking about buying from you initially. Arnie also expounded on the fact that the convergence of search, social and content marketing is a good way to give users a better experience. He offered different tools to create good content, such as Google Reasearch Tools, Yahoo Answers or Quora to listen to Frequently Asked Questions of potential clients. Also, he mentioned that LinkedIn groups are a great way for B2B companies as well. 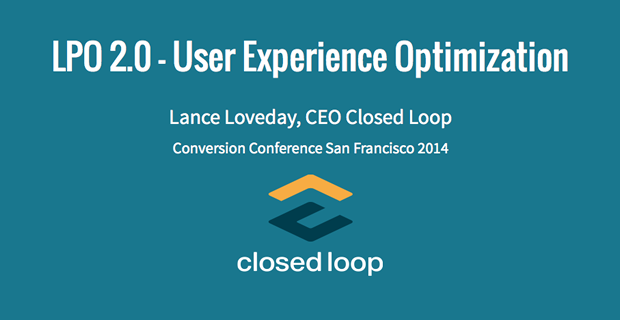 User Experience Optimization by Lance Loveday, Founder & CEO at ClosedLoop. Lance Loveday explained to the audience how User Experience can increase conversions by improving the way your visitors interact with your site or landing page. In many organizations, he said, design is not necessarily a critical skill, and also that the use of templates can hurt the user’s experience. He mentioned that just a simple “one size fit’s all” template solution won’t fit for all of the differing situations and different audiences. Don’t focus on just one way to get feedback, use qualitative and quantitative sources. “Buyers need and crave information that helps them make informed decisions. Businesses that provide the content people are searching for will win” . By Arnie Kuenn,Vertical Measures. 2. Infusing UX into your LPO: How to make the experience “feel right”, by Lance Loveday. 3. The Keys to Success by Tim Ash. 4. Dave Rogers, Principal at ConvertClick Showed us 8 Elements That You Can Test on an eCommerce Site. 5. Don’t Rely on User Knowledge, by Larry Marine, Principle at Intuitive Design. Bridge the gap with your knowledge. 6. How do we Deliver the Best Experience Exactly When & Where the Customer Wants It? By Kevin Lindsay, Adobe. Changes that help persuade on laptops, may add too much information and contribute to friction on mobile devices. As you read, this is just the tip of the iceberg! Day 1 was an amazing day full of new ideas and wise advice regarding Conversion Optimization, Content Marketing, A/b Test, Buyer Personas and more. If you want to check and download the slides of each presentation, enter here and feel like you've been there too! However, while we’re getting ready to present the best of day #2, check out our interviews with top conversion experts such as Tim Ash, Rich Page and Bryan Eisenberg. And remember stay tuned for the best of day 2. Big Surprise: We Have Something For You! So what do I have to do to win these amazing books? Just leave us a comment on this post saying you want one of the books, or share this post with your friends by clicking here! That's all you have to do, we'll announce the winners though our Social Media Channels such ash Twitter, Facebook and Google+, and also though our blog. So stay tuned to know if you were one the lucky ones! Good luck!